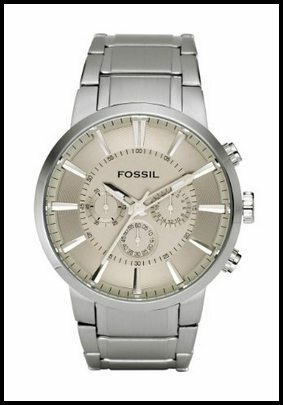 The Fossil Men's FS4359 Stainless Steel Bracelet Silver Analog Dial Chronograph Watch is an elegant and fine looking timepiece. It is perfectly designed for everyday wear due to its versatile design and neutral color. This Fossil watch can also be a great accessory to your business suits and formal attires. Dimension – The case diameter is 52 mm while the thickness is 12 mm. Weight – It has a weight of 10.23 ounces. Stainless steel case– The watch case is made with stainless steel case. It also comes with a solid case back. Quartz movement– The time keeping mechanism of this quartz watch is accurate and precise. Silver Analog Dial – The watch has a silver analog dial with three chronograph sub-dials for tracking elapsed time for up to 24 hours. Mineral crystal window – The mineral crystal provides a lot protection to the dial. Silver stainless steel bracelet– The bracelet of the watch is made with stainless steel. The width of the bracelet is 22 mm. The bracelet can be fastened through a fold over clasp. Stainless steel bezel – It comes with a stationary stainless steel bezel. Water-resistant – This watch is water proof at 50 meters/165 feet and water pressure resistant at 5 bar. Additional Features – The watch comes with three chronograph sub-dials for second, minute and hour functions. The Fossil watch is made with high quality materials. The high quality stainless steel material is sturdy and durable which makes it a classy looking timepiece. Likewise, the mineral crystal window gives a lot of protection to the dial. The watch has a balanced weight. You can comfortably feel it in your arms when you are wearing it. The stainless steel bracelet and the silver round dial has a versatile look that perfectly matches any style. Also, it has an extra huge dial that is perfect for men with bigger arms. It can be an everyday accessory that can complement any casual or business attire. The classy looking watch has a manly and vintage appeal due to its stainless steel construction. This watch has a reasonable value given its high quality construction and expensive looking design. If you are looking for a simple yet stylish accessory, this watch can provide an excellent value for a reasonable price. The timekeeping mechanism of this watch is accurate and precise due to the quartz movement. Thus, you can guarantee the consistent and reliable performance of this watch. The watch has a few but minor disadvantages. First, the watch is larger and heavier than it appears on the photos. Thus, this watch is not recommended to men who do not like massive and bulky accessory. Likewise, the watch will be more stylish and functional if the hands and markers are luminous. 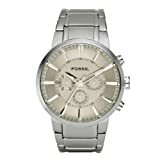 Over-all, the Fossil Men’s FS4359 Stainless Steel Bracelet Silver Analog Dial Chronograph Watch is a high quality and elegant timepiece with a remarkable value. 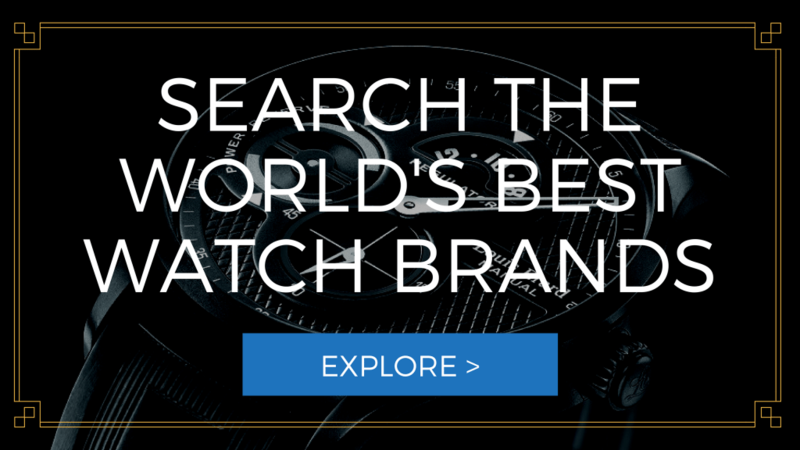 We are a small team of watch enthusiasts who provide authentic overviews and recommend amazing watches we think people will love. We want you to know that we participate affiliate programs like Amazon Associates which means we sometimes get a commission through purchases made through our links.